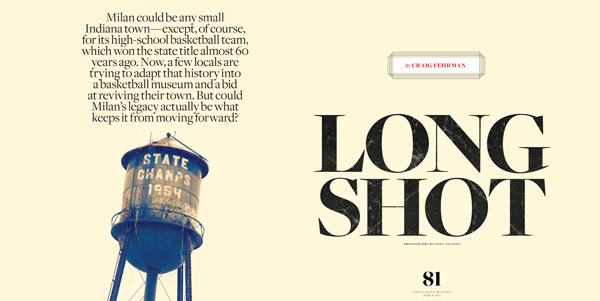 In this month’s issue of Indianapolis Monthly, I’ve got a long feature on Milan, Indiana — the small town that inspired Hoosiers and that’s struggled ever since. The magazine’s website is in the middle of a redesign, so the story didn’t make it online. I’m posting a slightly longer version of it below the jump. 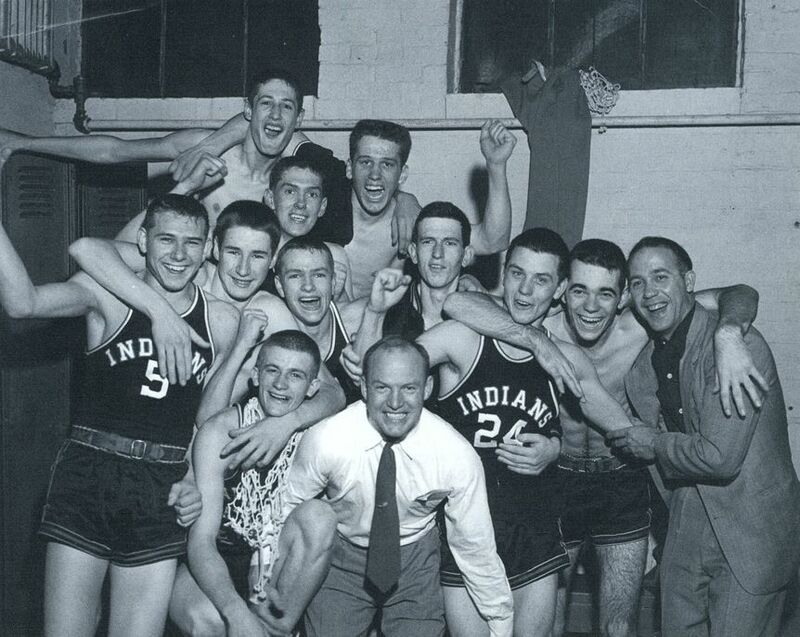 Milan could be any Indiana town — except, of course, for its high school basketball team, which won the state tournament almost 60 years ago. Now, a few locals are trying to convert that tradition into a basketball museum and a shot at reviving their town. But what if Milan’s legacy is what’s holding it back? So there’s this picture. It’s of the 1954 Milan Indians, and it’s not the reserved, rigorously posed one everyone knows. Somebody — no one remembers who — took this picture right after the team shocked the state, took it inside their Hinkle Fieldhouse locker room where it’s all sweat and self-pinching, where the players and coaches are tightly woven together, wearing a series of expressions that reveal just how many ways human beings can feel joy. You might not know the picture, but you know the story: the high school whose enrollment is 161, led by the coach whose favorite phrase is “I’ll try,” watches the player who doesn’t own a telephone hit the game-winning shot. The next day, 40,000 fans lined the road leading back to Milan, spilling into fields and onto building tops, waving homemade signs, enduring Manhattan levels of honking. People have been celebrating the team ever since — especially after it was Hollywoodized in Hoosiers. Milan frequently crops up on Top-Whatever lists (Sports Illustrated’s “20 Favorite Teams of the Century”), and Butler’s Final Four run brought another wave of invocations. In 2011, however, Milan finds itself caught up in another — and, unfortunately, much more common — story: a withered downtown, a dearth of good jobs, and kids who head off to college and never come back. The town has become a weird mash-up of old and new, dying and getting-by, hallowed ground and Dairy Queen. Its aging population needs a pharmacy, but since they’re too few to keep one around they must drive twenty minutes to fill a prescription. The Milan Plaza, a strip mall decorated in the school’s colors of black and gold, has vacancies in four of its seven storefronts. No realtor has even bothered to put up signs for prospective clients. But local nonprofit, Milan ‘54, Inc., wants to change this by building a brand-new, big-money museum to capitalize on the town’s legacy. The nonprofit includes eight men and women — some of them former players, others related to former players, one even related to the ‘54 mascot. They’re some of Milan’s best and brightest, people who seem smart and passionate and more than a little stubborn. At stake, they believe, is more than just a team or a game or a legacy. It’s a small town and its way of life. Still, when you see what the group is up against, you realize that this might not be the right plan to save the town — or even the right lesson to draw from the original team. In Milan and Indy and everywhere else, the boys of ‘54 have become a parable, something that can dilate to the level of the American Dream or shrink down to the smallest daily struggle. But the real point of the Milan Miracle is in that forgotten picture, and in that picture is why we play (and watch) sports. It’s not about innocence or destiny or David or Goliath. It’s about base stuff like effort and competition — stuff that sometimes pays off and sometimes doesn’t. Right now, the Milan ‘54 museum is crammed into an old Main Street barbershop. It looks a lot like the one where Gene Hackman meets the Hickory patriarchs, except this one — “Nichol’s Barber Shop” is still stenciled in the window — is much, much smaller. It’s an incredible collection — especially if you’ve passed through Milan for most of your life without even knowing it existed. Like my father and grandfather, I grew up about five miles from Milan. Still, none of us had heard of the museum. And so, last January — I’d moved to Connecticut after college, but was home for Christmas — I found myself on my first visit, sitting in an uncomfortably inclined barber’s chair and talking with Tom Kohlmeier and Roselyn McKittrick, two of the museum’s biggest boosters. “It just happened,” Roselyn says of the museum. “There wasn’t a big plan.” Roselyn, wearing a white turtleneck and even whiter Keds, is now in her 70s, but when Hoosiers came out she was still running Milan’s Railroad Inn, which was widely esteemed for its fried chicken. (Roselyn ended up selling the restaurant, and it has since closed — because, she contends, “the new owner tried to turn it into a 4-star.”) At the request of some local Boy Scouts, Roselyn put out a few 5x7s from Hoosiers at the Railroad Inn. The photos sold out in a week, and the movie — which Roselyn, like everyone else I talked to, loves; “truth, if not accuracy” is the company line — catalyzed everything. It convinced her a museum might work. So Roselyn began acquiring and displaying Milan memorabilia at the Railroad Inn, then at her next business, an antique store. In 2000, she and a few other locals formed Milan ‘54, Inc., and bigger plans began to take shape. In 2002, they bought the old State Bank of Milan, a two-story brick building that sits right next to Nichol’s Barber Shop. They also hired Schmidt Associates, an Indianapolis consulting firm, to draw up an ambitious plan that called for the restoration of the Bank to its 1954 state, along with additions like turning the vault into a display room for the championship trophy and converting an outside wall into a simulated barn door and basketball hoop. It all sounds state-of-the-art. But a quality product costs money — $2.5 million, according to Schmidt Associates. Roselyn insists Milan ‘54 “won’t spend the money if we don’t have it.” To buy the Bank, which cost $60,000, the group received a grant for $50,000 from the philanthropic arm of a local casino. They also got $3,000 from Gov. Mitch Daniels’s foundation, and their website — like the museum, it offers Milan ‘54 shirts, hats, and DVDs, all with optional player autographs — has brought in “a few thousand dollars.” But that’s about it. Indiana still loves its most famous underdogs — the State Senate passed a resolution honoring the team in 2004 — but more tangible recognition has been harder to find. The Milan ‘54 members also feel like they’ve been neglected at home. “The town,” as Tom Kohlmeier puts it, “is anesthetized to the story.” While Tom was only three years old in 1954, he still feels a connection to the team, perhaps because his parents and grandparents attended every game that season, perhaps because his P.E. teachers showed the ‘54 game film in class every year. Dressed in blue jeans and a bomber jacket, Tom is blunt and intense, quickly confessing, for instance, that he left Milan for college and never came back. (This may be the ‘54 team’s most lasting legacy: of its 10 players, nine went to college and eight graduated — all shocking statistics in 1950s Indiana.) But Tom and the rest of the group remain frustrated by the lack of local support. “The tanning shop, which is four blocks down, didn’t know where we were,” says Roselyn. Tom mentions that a local photographer with a whole basement full of images from the game won’t let the museum even see them without first paying a fee. And then there’s the town’s brand new sign, a simple “Welcome to Milan, Est. 1854” number that replaced the old one and its prominent “1954 State Champs” logo. Such slights aggravate Tom because, to his mind, they trip up not only the museum, but the town itself. Where Roselyn offers a mix of hope and historical perspective — for the town’s sesquicentennial in 2004, she co-wrote a fascinating history of Milan — Tom brings a strong business sense to the Milan ‘54 group. He now lives and owns a company in Noblesville, but hopes to retire in Milan — and in a Milan closer to the one where he was born and raised. Milan used to be “self-contained” and “vertically integrated,” Tom says, and the Milan Miracle simply confirmed what the natives had known all along: that Milan was a wonderful place to live, work, and play. Few people work or play there today. And while the Milan ‘54 group understands that the museum won’t save the town by itself, they do hope it will inspire an economic renaissance. Tom dreams of “an open-air terrace” downtown (and he ticks off several municipal models). Roselyn suggests a soda fountain and a smattering of specialty shops. But they also admit they’d settle even for corporate clients, with Tom bringing up Subway and CVS by name. The mention of CVS causes everyone to stop and fret over Milan’s lack of a pharmacy. It’s enough to make even McKittrick pause. “We are under time pressure because of the age of the players,” she says — and, it’s implied, the age of the Milan ‘54 board, the youngest of whom are closing in on retirement. But when I ask about what they’ll do if they don’t get the full $2.5 million, Tom jumps in again. To understand statements like this, you need to understand what the Milan ‘54 group are trying to build — or, more accurately, what they’re trying to revive. In 1954, Milan was a typical small town, meriting barely a mention in the Federal Writers’ Project guide to Indiana. Its 1,150 citizens were happily stranded between Indianapolis and Cincinnati, surrounded by cornfields and the occasional wood-frame farmhouse. This hasn’t really changed — Milan’s population is up to 1,800, and a few of its fields have been broken up by newer homes — but, for the first half of the twentieth century, Milan’s isolation served as its greatest strength. To accommodate the local farmers and factory workers, Milan’s downtown grew into three business-packed blocks: a bakery, a jewelry store, a shoe store, a dress store, a drug store, a dime store with comic books and hair barrettes, a clinic with five doctors, several department stores and groceries, and more. There were restaurants like Arkenberg’s Ideal Dining Room, whose owner left basketball games early to start on the players’ milkshakes and burgers. Best (and biggest) of all, there was Chris Volz Motors, a dealership with enough selection to draw Cincinnati Reds players to Milan. At the grand opening of his new location in 1950 (and this is all in Roselyn’s book), Volz handed out 4,800 bottles of Coca Cola and 5,500 hot dogs. Several ‘54 players worked for Volz, and he coordinated a fleet of Cadillacs to bring the state champs home from Indianapolis in style. The final stretch of the Cadillacs’ route — the part lined with 40,000 fans — followed State Road 101. But this would soon change. In 1956, Milan got a bypass that shifted 101 from Main Street to a newer, speedier road. In some places, the route moved only few hundred yards, but it was a big enough change to earn a photo spread in the Indianapolis News. Before too long, those pictures began to feel like the first part of a before-and-after set. In 1959, the first grocery store left Milan’s downtown; by 1968, another had moved out to the bypass and the new Milan Plaza, where it was soon joined by the Milan Drug Store and the local dime store. A new hardware store opened on the bypass in 1961. The old railroad station was torn down in 1964. By 1974, the town was down to one doctor. As this was happening in Milan, of course, it was happening everywhere else. And the other bypasses, along with the completion of Interstate 74, began to leach away Milan’s remaining stores and traffic. My dad, who was born in 1959, doesn’t remember the vibrant downtown version of Milan. The town’s main employer, the Milan Furniture Manufacturing Company, which employed around 200 people at its peak, burned down in 1980. Most locals see this as the violent coda to a decline that began only a few years earlier. The last movie to play at the Milan Theater was 1958’s Cat on a Hot Tin Roof. For the Hoosiers premiere in 1986, the town loaded into school buses and went to nearby Batesville, then came back to Milan High School for a big reception. Last summer, I visited Milan a second time. I planned to check in with Roselyn and Tom. But first, I wanted to go to the grand opening and dedication of the Milan Public Library, which promised to be the town’s social event of 2010 — and, in comparison to the basketball museum, a very different vision for its future. The afternoon commenced with a classic Indiana rainstorm, but it didn’t slow the turnout. In fact, by the time the ceremony began, the library’s parking lot was so full that people were parking their cars and trucks in the mud alongside the road. While stragglers continued to arrive, a local minister led us in a prayer and the pledge under the new building’s outsized American flag. Next came a ribbon cutting, complete with giant scissors and the local State Rep. But things soon turned serious, and the remaining speakers — each of whom had to brave the new sound system’s squealing feedback — explained how exactly the Milan Public Library went from a hazy dream in 1992 to a reality today. Technically, we were standing in the Milan Branch of the Osgood Public Library because Milan and its surrounding townships did not have enough people to start a library. The Milan Library Project, a group of six volunteers, had struggled with all sorts of legal and bureaucratic hang-ups. They wrote letters, walked beside parade floats, made presentation after presentation. And then there was the money. In 2002, ten years into their quest, they received a huge boost when Mabel Lamb, a local teacher who lived in Milan until her death at the age of 97, left them five acres and $50,000. It became the seed money for earning enough grants to cover the construction costs, which came in at just under a million dollars. The library that resulted, with its high ceilings and bright colors and the first Wi-Fi hotspot in town history, immediately stood as the newest, nicest building in Milan. But it was clear from the ceremony’s speeches and throat-clearings and hugs and, finally, tears — it was clear that the library was also much more. “Children” and “opportunity” were the day’s refrains, and everyone nodded as if they were at a revival. John Ingram, Milan’s town manager (i.e., its mayor), seemed to agree. In his messy, windowless office, which included an autographed ball from the ‘54 team, Ingram praised Milan’s quality of life — a few months back, it had its first home burglary in “10 or 12 years” — but remained realistic about its limitations. Milan, like everywhere else, Ingram said, was still hurting from the recession, though he cheerfully added that “technically, there aren’t any businesses to suffer.” He had nothing but nice things to say about town’s basketball legacy, but added that he was far more worried about working toward a new sewer plant. My grandparents first met Roselyn in 1952 at the Tomb of the Unknown Soldier in Washington, D.C., when my grandfather, who’d just enlisted in the Army, bumped into her soon-to-be husband, a Navy man, each with his significant other in tow.S ince she was dating a local boy, Roselyn kept up with the Milan team two years later, through the newspaper. In 1956, she moved there, raised three children there. All this to say that, for Roselyn, or for Tom, whose family owned the furniture factory for a while, or for anyone else affiliated with the museum, Milan’s history is also a personal history. That’s why the town’s current ambivalence feels like an insult. It’s also why the Milan ‘54 group seems nostalgic not simply for a team, but also for a way of life — for a time when Milan was a destination and not a departure point. But don’t we have to talk about it? Don’t we have to talk about how the Milan ‘54 group is trying to raise money in an economy that forced even the mighty Indianapolis Museum of Art to lay off 10 percent of its staff? Don’t we have to talk about how Milan sits in the middle of a cultural wasteland, too far from both Cincinnati and Indianapolis to draw consistent, museum-sustaining crowds? And, most importantly, don’t we have to talk about how the Milan ‘54 group’s downtown plan seems rigid and maybe even a little naïve, based more on a desire for the past than a plan for the future? After all, for a lot of people, the State Road 101 bypass looked like progress. And the things Milan does have going for it — the new Dollar General; a paper company and lumber yard and assisted living community, all arriving soon; and, yes, the library — now form a long, thin strip of stores, small businesses, and nicer houses all along the bypass. The downtown, meanwhile, has become Milan’s worst section. In addition to Nichol’s Barbershop and the town government building, you’ll find a food pantry (“operated by Milan Council of Churches”), Wayne’s Meats, B&L Motorsports, and not much else. The movie theater, which had been resurrected as a gym during my first visit, is empty again. The Milan Computer Repair displays the sun-bleached boxes of a 56k modem and an external CD drive in its windows. The iconic Milan water tower fell into disrepair long ago and is now graffitied and surrounded by scrap metal and rusted-out machinery. More than half of the houses have been turned into rental units, as have many of former retail locations, their storefront windows now boarded up kitchens or living rooms. The counterargument — to the pothole-obsessed public, to the local boy turned East Coast cynic — remains the same: believe. Believe in big dreams. Believe in town-sized miracles. Believe in one more upset. Roselyn can point to her cache of letters, voice mails, and, most of all, stories from people who have made pilgrimages to Milan. The museum attracts visitors from all 50 states and 14 foreign countries, but it draws only 40 people a week. (That number jumped to 74 during the week of Butler’s Final Four appearance.) Souvenir sales and the proceeds from Roselyn’s book keep the doors open a few hours each day, Wednesday through Sunday, but only in an overhead-free location like Nichol’s Barber Shop, and only with a volunteer staff. Even under these conditions, the Milan ‘54 museum remains worth a visit, on the chance you’re passing through. After looking at the memorabilia, you can talk to Roselyn. She might be sitting at the desk in the back, addressing copies of Hoopla, the group’s newsletter, to state officials. She might be working on the Milan ‘54 application to the Indiana Historical Society’s list of endangered sites. (“We know that’s normally for buildings, but we feel the story’s endangered.”) She might even be willing to help you shake the feeling that, this time, Milan will soon know the taste of defeat. This entry was posted in Features, Hoosiers, Sports. Bookmark the permalink. 5 Responses to Hoosiers, Redux? Craig: Nice article! I’m a 1990 graduate of Milan High School. Thanks for reading, Erik! Hope you found the story to be reasonable and fair. Wanted to make sure this is an active site before I respond further, enjoyed your article, I have some views on the subject.